This light, bright brand new cottage is located in the heart of the St Johns neighborhood in Portland. Full of charm it features loads of reclaimed wood with an industrial, farmhouse vibe. Complete with a private deck, keyless entry, full kitchen with eat in island and a sleeping loft with a queen sized bed. It is a close walk to restaurants, coffee shops, bars and shopping. Easy access to downtown Portland, University of Portland, the airport and the rest that Portland has to offer. 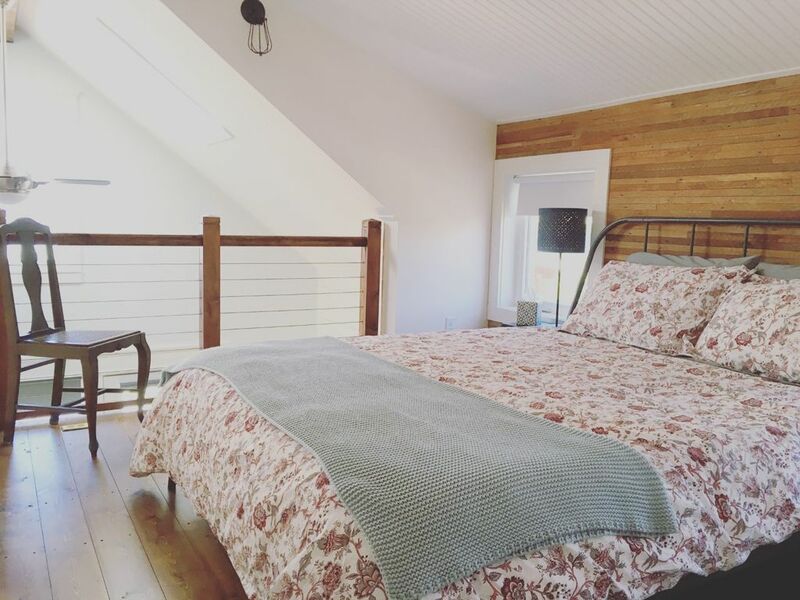 This cozy cottage features a loft bedroom with a memory foam queen sized bed and tempurpedic pillows. Complete with a full kitchen including concrete countertops, butcher block island and stainless steel appliances. The bathroom, located on the main floor includes a stand up walk-in shower, reclaimed wood vanity and awesome wallpaper. The seating area includes a sofa with pull out queen sized sleeper bed, a record player with bluetooth capabilities to play your favorite tunes and some board games and books. We live on the property in the main house and are happy to interact as much as you like. We are always happy to offer suggestions on where to eat, drink and explore. Having a keyless entry will provide you all the privacy you desire. St. Johns is a neighborhood of Portland, Oregon located in North Portland on the tip of the peninsula formed by the confluence of the Willamette and the Columbia Rivers. St. Johns sits north of Cathedral Park, which is home to the only suspension bridge in the Willamette Valley, the iconic St. Johns Bridge. St. Johns is described by locals as "extremely friendly", "A town within a city..." The post office, coffee shops, breakfast places, restaurants, movie theaters, grocery stores, and several parks, are all within walking distance for residents and guests. This cottage is neat, well-equipped and private, but the hosts are as attentive and helpful as you want. It is the perfect place for a single or couple to spend a few days. Thanks very much for sharing your property! It's great when a place is even better than the pictures! We stayed here to visit our daughter in St Johns, so we spent most of the days out doing things with her. We didn't take advantage of many of the great features, like the well equipped kitchen and the cute front porch. We did enjoy the Nespresso coffee maker, the very comfortable bed, and the big shower with a shower head for tall people. Even though this cottage is on the same property as the owner, you felt that it was very private since it had it's own entrance and was a separate building. You can tell that the owners really put a lot of thought into building this cottage! Very nice & comfortable stay! You can tell this place is brand new. Everything was so nice and comfortable. There were games, records, and the owners topped the experience off by leaving a handwritten note and treats. This was definitely a gem and a place I’d love to return to in the future!! !